Why Teach Humane Education in the Classroom? fosters a sense of responsibility on the part of children to make choices and act upon their personal beliefs. Our Humane Education program is inclusive, and meant for children and youth of all abilities. COST: All humane education presentations are complimentary and intended to aid current curriculums. We happily accept donations — both financial and in-kind. For in-kind donation ideas, please visit our Wish List. Do you teach students who are new to Canada? Ask us about our presentation for Newcomer students. Scroll down to read more about the available presentations. 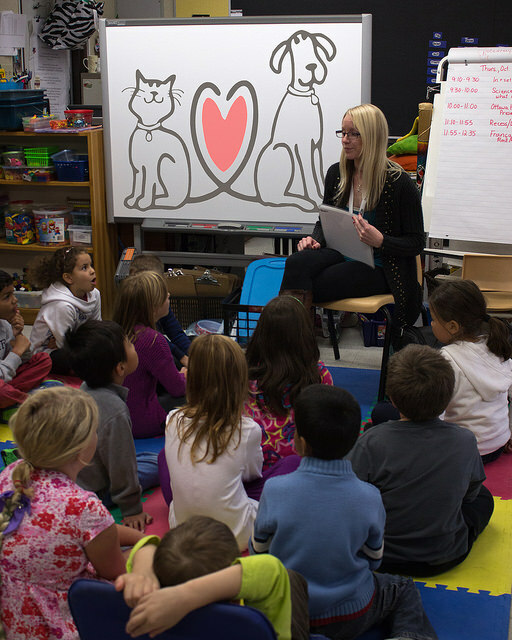 The Ottawa Humane Society has delivered its successful, in-school program to students for many years. 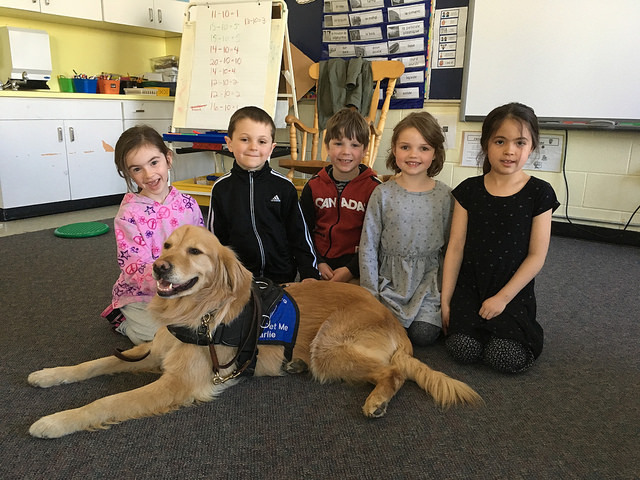 This program brings animal-awareness into Ottawa area classrooms through age-appropriate presentations exploring animal welfare topics and responsible pet ownership. In addition, we offer Dog Buddies, which is a popular Grade 1 and 2 bite prevention partnership program between the City of Ottawa Public Health Department and the OHS. Education sessions are conducted on request from the teacher or school. A two-member team of volunteer humane educators is available, Monday through Friday, during regular school hours. Each presentation lasts approximately one-hour. When possible, presentations include a safe, ‘hands-on’ introduction to a behaviourally assessed, companion dog. In addition, relevant handouts are provided to each child. To book a presentation, contact the coordinator: humane education at 613-725-3166 ext. 235 or at humaneeducation@ottawahumane.ca or fill out our humane education request form. 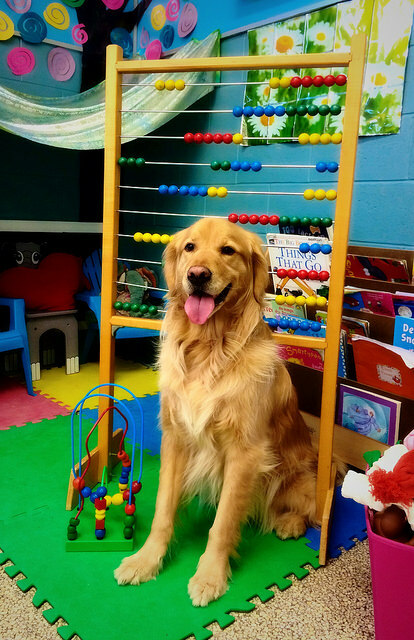 Pour réserver une présentation, communiquez avec notre coordinatrice : éducation en bien-être animal au bienetreanimal@ottawahumane.ca ou au 613 725 3166, poste 204. Each year, the OHS has many inquiries from youth interested in animal welfare, including those looking for volunteer opportunities or to explore a future animal-related career. Their interest prompted the OHS to expand our popular, existing program to include high schools. By reaching today’s youth, the OHS hopes to increase critical thinking about responsible pet ownership and to promote young people’s involvement in animal welfare, ensuring a brighter future for tomorrow’s animals, in our community! Education sessions are conducted on request from a teacher or school. 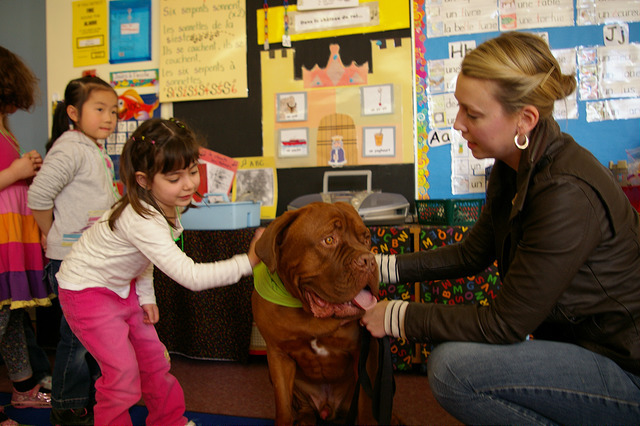 A two-member team of volunteer humane educators is available during regular school hours. Each presentation lasts approximately one hour. When possible, presentations include a safe, hands-on introduction with a behaviourally assessed dog.